[#TAKEOVER] Growing up in the Arizona heat, I instantly fell in love with the fabulous weather here in Long Beach. The small border town I come from can quickly make a person like me feel small and out of place. In Long Beach, there are wide open bike lanes and an incredible amount of cyclists. Working with @maritimecourier allows me to contribute to the community and feel part of something bigger than just bikes. The effort of riding through all types of weather certainly pays off with these amazing work views. ### We’re letting a few #lbpost readers take over our Instagram for a week to showcase how they live #LongBeach. This week @lauraimnot shows you her #LifeinLB. It’s #TakeoverTuesday, when we pull our most recent Instagram takeover participant off the ‘gram and onto our website for a fun Q&A on what they’re all about. 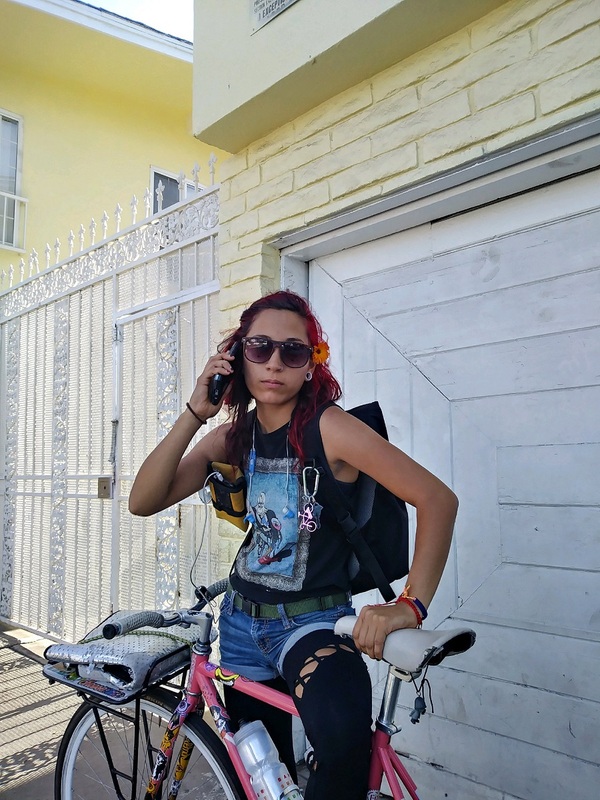 Last week, Laura Robles (@lauraimnot) brought @longbeachpost followers a series of serene scenes from her job as a bicycle courier for Maritime Courier and as a budding competitive cyclist for Team Peach Cycling. We asked the Arizona native about choosing Long Beach as her new home, what inspires her to be out and about on her bike and more. Can you elaborate a little more on the Arizona town that you’re from? What’s it like? Yuma is rich in culture with farmland that stretches for miles along wide open dry roads. If you can beat the heat, its blue sunny skies make it easy to be outdoors all the time. With its location halfway between San Diego and Phoenix, the ideal thing to do for entertainment is to get away on a road trip, even if just for the weekend. It’s a quiet and cozy town that ultimately makes it more suitable for families or elderly folks looking for adventure. [#TAKEOVER] Hello beautiful Long Beach! Did you catch Stage 1 of the @amgentoc? I'm @lauraimnot and the @longbeachpost has invited me to show you my #LifeinLB. I moved to Long Beach 9 months ago with my twin sister inspired by the art and bicycle culture this community has to offer. I am a full-time bicycle courier for @maritimecourier and a part-time fixed gear bicycle racer. Its hard to quantify one's love for bikes, but if you felt the energy this event brought to the city you could understand how much bikes mean to people. ### We’re letting a few #lbpost readers take over our Instagram for a week to showcase how they live #LongBeach. This week @lauraimnot shows you her #LifeinLB. Why did you choose to move to Long Beach? Were you considering any other cities, if so why was Long Beach your top choice? I had originally wanted to move to Los Angeles, and honestly had never been to Long Beach before moving here. I had a really hard time finding a place to rent because the cost of living in Arizona was far more affordable than the places I was looking for. I was lucky enough to have found a room for rent in Long Beach with Brendan, who is also a courier with Maritime. Not knowing much about this city, I solely relied on the opinions of my friends and families, all who had great things to say about the beach and the community. Convinced to become involved within the cycling community that California has, I made the move and found it to be the best thing I have ever done for myself. [#TAKEOVER] There is no better way to beat a case of the "Mondays" than to ride out fast and early with my partner, my boss, and my homie. This trio makes a trip to the pain cave a lot more interesting. ### We’re letting a few #lbpost readers take over our Instagram for a week to showcase how they live #LongBeach. This week @lauraimnot shows you her #LifeinLB. What are some of the ups and downs of moving from your hometown? Was it hard to leave? What has made moving to Long Beach worth that journey? The hardest part about moving to Long Beach was definitely adjusting to the new cost of living and taking in all the changes. The support I received from my family and friends made it easy to stay strong during the challenges I faced, however being away from them has been a consistent sacrifice. It’s easy to indulge myself in my passion for cycling, so leaving was necessary. Being able to invest in my goals and dreams makes everything I do worth it, especially now that I have a partner who shares the same passion. Since meeting Israel (Izzy), I’ve been able to experience Long Beach and the SoCal cycling community in ways I had only imagined. He’s made everything I set myself out to do here achievable and has loved me along the way. With an inspiring partner like him, I’m proud to say I am now a bike courier and a bike racer. [#TAKEOVER] In between runs, my partner and I enjoy meeting up for burritos from Hole Mole. It is a quick and cheap way to refuel and be ready to work again. Some days require a mid-day coffee from Portfolio in order to power through the night shift as well. ### We’re letting a few #lbpost readers take over our Instagram for a week to showcase how they live #LongBeach. This week @lauraimnot shows you her #LifeinLB. Do you have a favorite spot to hang out in between runs when you’re working? To be honest, in between runs my favorite spot to hang out at is wherever Izzy is. Whether on a close-by ledge or across zones for burritos, I’ll probably be looking for him on my stand by time. If it’s not a ledge within the neighborhoods, we meet up at places like MVPs, Portfolio Coffeehouse, or Salud Juice on Cherry. The central locations within the maritime zones make it easy to get back to work. [#TAKEOVER] Keeping an artistic eye open while on my bike helps me find beauty, not only in the city I live in but in my journey too. ### We’re letting a few #lbpost readers take over our Instagram for a week to showcase how they live #LongBeach. This week @lauraimnot shows you her #LifeinLB. What have you learned about yourself as a competitive cyclist with just a few months of experience? Enjoying the journey is the most important thing I’ve come to learn. The hard work and dedication I’ve invested into becoming a competitive cyclist hasn’t showed me any podium results, but keeping a good spirit is key. Learning to race comes with racing and as long as I am able to have a good time with good people I can be happy with the learning experience alone. The talent in the women’s category is fierce and backed by performances that kill out there, so I’ve learned to be patient with myself in order to get past the intimidation that comes with lining up at the starting line. Ultimately, the positive energy invested by the community as a whole offers a humbling environment that is fulfilling to be a part of. Want a shot at a takeover? Is your profile public? Email [email protected] with a little information about yourself, why you love Long Beach and why you’d be a great @longbeachpost #TAKEOVER candidate!